I am a type person that sometimes travel both for business and for pleasure. Normally I will check Google maps for location and the hotels near the place where I need to visit, Then I will go to review site to find out the best hotel for me, not only for the rate but the reviews of people who have experienced the place. 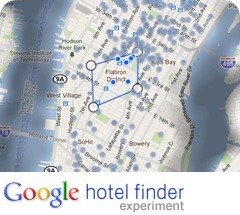 Good to know that Google is experimenting on Google’s Hotel Finder. Google Hotel finder will aim to give the information that a traveller would like to see in order to plan for the trip. Draw simple shapes to define the neighborhoods (yes, more than one!) that interest you. One click adds hotels to your shortlist, where you can review them easily. See if you will get a good deal by by comparing a hotel’s current price with its typical one. Please be informed that as of this post, Google Hotel finder is only available in United States.